The greatest, best, and most beautiful place I've ever car camped was on top of a cliff in the Buffalo Gap National Grassland. Here's what you need to know. Travel with Lauren Smith as she finds a sense of home on the road, much like the migrating birds she studies. "The month after I moved to Montana I went to an environmental conference in Waterton Lakes National Park, Alberta. There, I heard a Blackfeet elder say this: “We are bound by breath to honor and take care of this place.” The elder was speaking about conservation, and how it is important to care for all parts of an ecosystem—the watershed, the soil, the plants, the animals. To care, the elder said, you need to settle in a place and let it settle in you. Once this happens, you are bound by breath to honor and care for that place." Click here to continue. An hour later and I'm clinging to a cable on the side of the mountain, treading a path so narrow my feet no longer fit side by side safely, but only one in front of the other. There is a steep, almost vertical drop to my right hand side. Indeed, at one point there is only a metal bar sticking out from the sheer rock, bridging the next bit of narrow path. Don't look down, I think. Hang on to the cable with both hands. Phew. Done. "Driving from Denver to Los Angeles with my first husband and baby son in 1973, I wanted to enjoy parts of the country I'd never experienced. Tiredness interfered with that often, sending me into uneasy dozes as Richard drove and Lyle sang with the radio, banging out time on his carseat. And so, only one sight has really stayed with me for all these years: Zion National Park in Utah." Read Patrick D Hahn's elegant recollection of eagle sightings at the Conowingo Hydroelectric Generating Station and dam in Maryland, one of the greatest places in all of North America for closeup views of the national bird, the bald eagle. Click here to explore more with Patrick and us! Robby DeGraff shares his personal story about the adventure he and his father had on a road trip out west. A stop at Badlands National Park profoundly changed their lives. Click here to read Robby's poignant essay. "I consider myself a champion of curiosity, and the life of Increase Lapham resonates powerfully for me," writes Janet Frost. "I don’t believe that it was an accident that a man driven by curiosity and the yearning for scientific knowledge landed in the territory of Wisconsin." Frost takes P&P readers through Lapham Peak Park, an enchanted wilderness with a prominent peak that rises 1,200 feet above sea level—click here to read more about Lapham's life and this majestic Wisconsin state park! 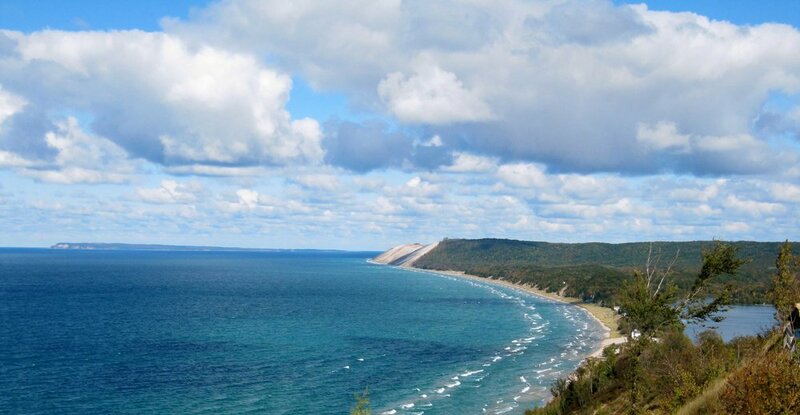 We're thrilled to share Jill Kolongowski's touching essay about childhood memories and sibling bonds, set on the shores of Lake Michigan at Sleeping Bear Dunes National Lakeshore. Click the photo or here to read. We're thrilled to share Cristian Silver's playful and informative guide to Fraser Island, a beautiful island a short ferry ride from Australia's Queensland Sunshine Coast. Click here to read and start planning your excursion to this island full of "dramatic contrasts and improbable landscapes."